So, your creative mom enjoys making projects? She likes to make items to decorate the home, make holiday gifts for family as well as friends and even make her own lotions, soaps, candles etc. Well, she’ll definitely love the art and craft gift basket you’re going to give her on Mother’s day or her birthday. How about a knitting kit for some knitting inspirations for mom or any one who loves knitting. Mom might even knit some comfy socks for you. A jewelry making kit would a wonderful DIY craft gift idea for adults who love making necklaces, bracelets etc. as a hobby. For those who love to do gardening, the DIY planting kit with seeds would be a good idea. 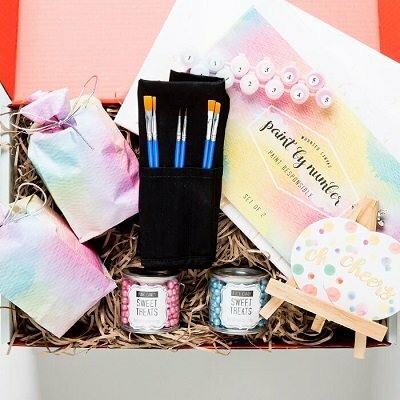 The art supply gift basket would make the creative person who loves doing crafts super happy indeed. 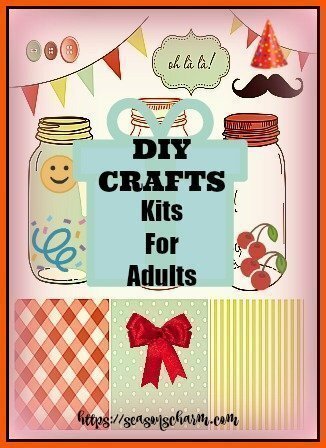 Let’s check out some diy craft kit gifts for adults. 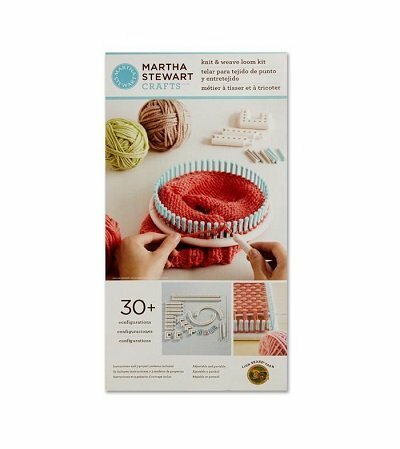 This crafts knitting kit comes with an instruction booklet for 3 projects – hat, scarf and blanket (in English, Spanish and French). The kit includes knitting tool, weaving tool, crochet hook, small and large yarn needles. You get a weaving loom, round loom, rake loom and rosette loom as well as a number of other knitting and weaving accessories. Yes, you get to try out a variety of sizes and shapes. Enjoy a glass of wine while painting your masterpiece. You get a choice of Fruity Cereal, Red Velvet, or Chocolate Molten flavor. 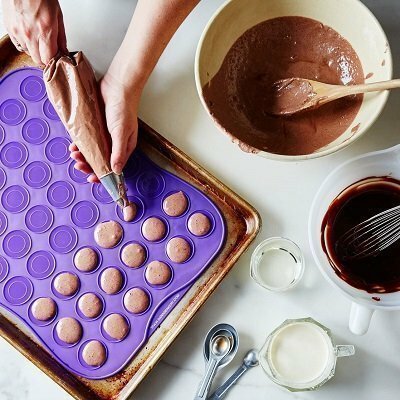 Made in Hawthorne, New Jersey, the kit includes 2 mix packets, 2 piping bags, 1 piping tip, and a recipe for filling, enough to make 20 two-inch macarons. Add in some of your own ingredients for a special unique taste. Fresh mushrooms harvested right from home – wow! that’s nice. 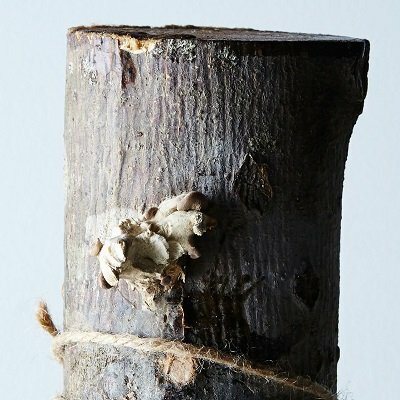 Gift this ‘grow your own mushroom log’ to your DIY mom, dad or friends and they’ll get a regular supply of shiitake or oyster mushrooms for their culinary delights. THis diy gift includes a hand cut log that has been inoculated with either shiitake or oyster mushroom spores in visible drill holes. These holes are then covered with cheese wax. Metal plaque on underside of log states date of inoculation. The natural wood log measures about 12″ long and about 3.6″ in diameter. Instructions are given on how to take care of the log for best results. This DIY shiitake mushroom log kit is a proven fruiter and you’ll end up with plenty of fresh mushrooms for your recipes. Making your own cheese sounds challenging. However, with a proper cheese making kit, it’s actually simple. 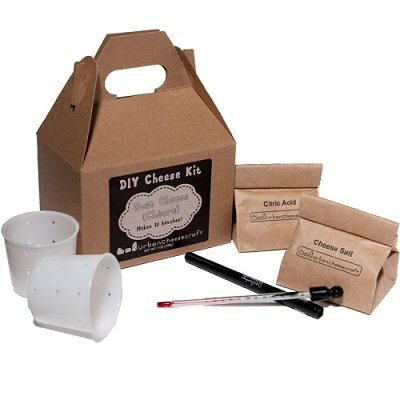 This made in USA goat cheese kit includes 4 oz. citric acid, 3 oz. cheese salt, cooking thermometer, fine cheesecloth, two food-grade polypropylene cheese molds and an instruction/recipe book. There is enough natural ingredients for making about 10 batches. Each batch is about 4 – 6 ounces. You’l need to buy your own goat’s milk. You need about 2 quarts per batch. Yes, making cheese at home can be fun. Add in fresh herbs for a unique aromatic taste. Healthy homemade cheese is free from preservatives. 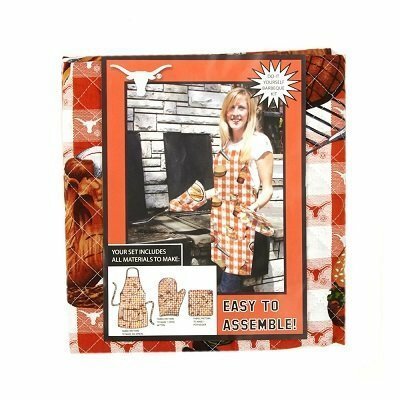 This DIY barbecue kit includes the fabric and patterns to make an apron, oven mitt and pot holder. These are made from 100% cotton and polyester fiberfill. Add this DIY barbecue sauce kit to complete your diy barbecue gift basket. These are truly unique paper crafts. 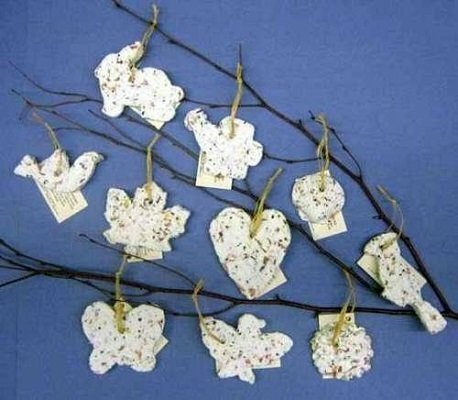 These paper ornaments are crafted from 100% recycled cotton fiber, fresh flowers and wildflower seeds. Made them into pretty hanging ornaments for special occasions. Then you plant them in 1/4 inch to 1/2 inch soil. Keep them watered and watch them bloom into pretty flowers. A twig tree display as well as informative POP signs are included for easy decorating purposes. This is a Spring/Summer Starter assortment with 96 ornaments and is available from January to August. The Fall/Winter Starter assortment is available September through December and comes with holiday shaped ornaments. You can now create an oil painting masterpiece with this DIY oil painting kit. The kit comes with painting brushes, acrylic paint, preprinted textured art canvas and simple to follow instructions. The canvas size measures 20″ x 16″. You can choose to order the canvas with frame or without frame. 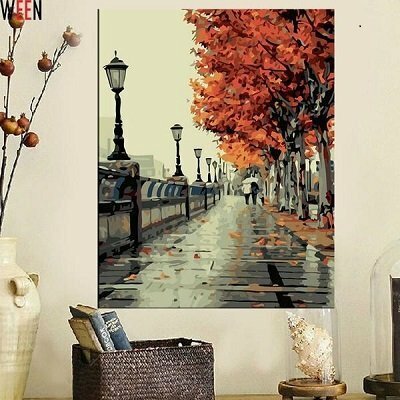 To paint this beautiful landscape DIY oil painting, just match the numbers on the canvas with the numbers on the paint. Yes, painting by numbers is easy and fun. You can use the paint as it is without the need to add water. Instead of coloring on a book, color your own 17 ounce travel mug and make it unique. Made of heat resistant ceramic, this color your own travel mug comes with a fitted, double-lip plastic lid featuring 3 rings of silicone to prevent leaks. Yes, this sure looks fun. You color it with food safe permanent markers (provided), then bake in a 375 degree oven for about 40 minutes. Make it bright and bold or let it remain in black and white – the choice is yours. 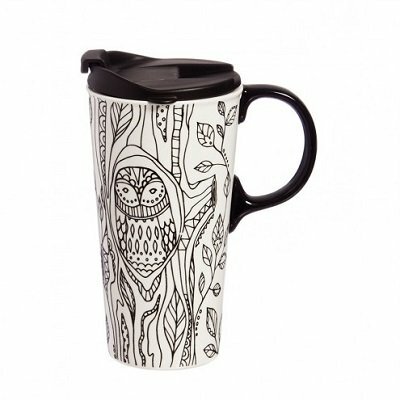 This color me coffee mug is a perfect gift for someone who loves coffee and coloring. Besides this just add color travel coffee mug, the just add color garden stepping stone with hummingbird design looks great too. 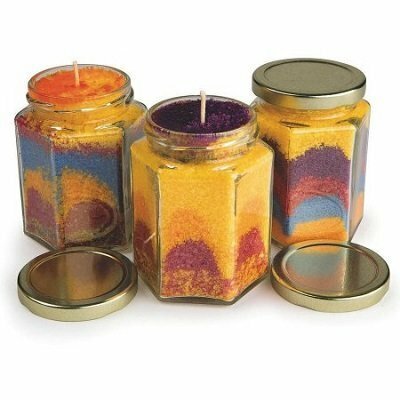 It is easy using colored granulated wax to make candles at home. The wax doesn’t need to be melted. Just pour the wax into your mold and get unique colored wax candles. It is a great way to make homemade candles as wax art doesn’t involve the melting of wax. You get 5 lbs of granulated wax in assorted colors, 12 hexagonal shape jars with lids (4oz), 12 wicks and instructions. The finished product measures 10″ x 8″. 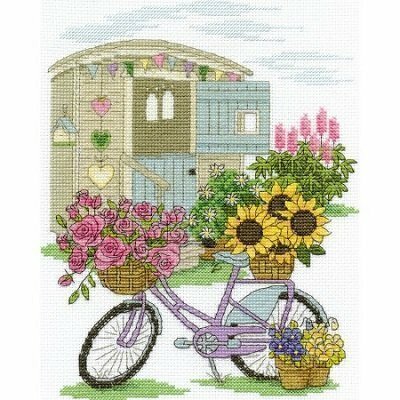 This counted cross stitch project is suitable even for beginners. This beautiful fresh cheerful design wall art will certainly enhance the wall decor of your room. 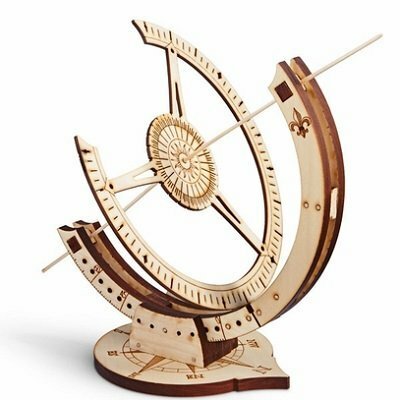 Made from poplar and birch wood, this DIY sundial kit comes with parts that are laser-cut for accuracy and has full-color instructions. The finished kit measures 12″h x 9″w x 9″d. You’ll need to standby sandpaper, glue, and razor saw (all these tools are not included) to construct your wooden sundial kit. Put it on your patio or desk and you have a beautiful conversation piece decor item.